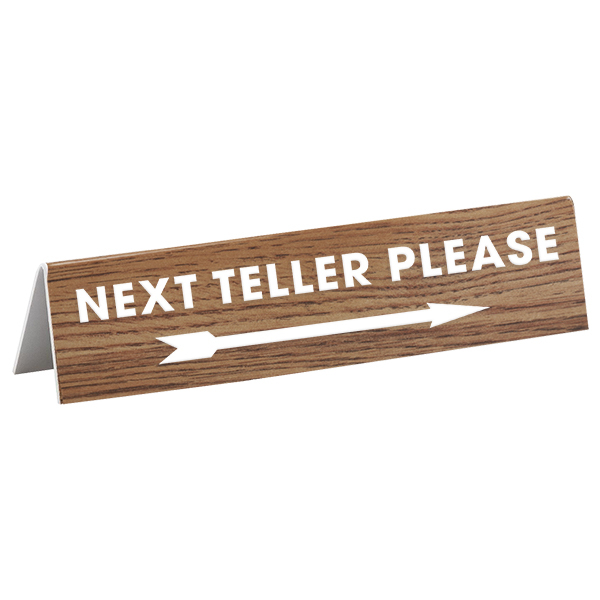 Engraved Counter Bent Next Teller Bank Sign | 2" x 8"
Simply sit this 2" x 8" Next Window Please with Arrow Counter Bent sign on the counter in front of your window when you need to take a lunch break or handle other banking or office business. Choice of engraving colors. Double sided. Next Window Bank Teller Engraved Counter Bent Sign | 2" x 8"
Provide each teller with their own 2" x 8" quality engraved counter bent sign that can be set in front of their window when they need to handle other banking duties. This next Teller Please with arrow is double sided & is lightweight & easy to set out. Order yours today in several engraving color choices.